Space NK Spring Beauty Edit Gift Bag event is available now everyone (no membership) at: SpaceNK.com/SpringBeautyEdit, through February 18, 2019. 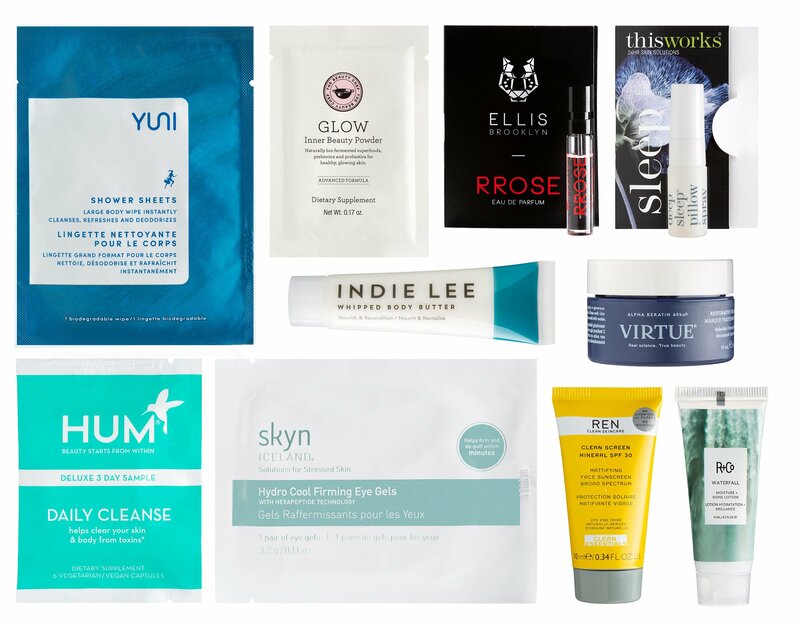 The biggest Space NK USA gift bag event is at us.spacenk.com only and Space NK 31-piece Spring Beauty Edit Gift Bag is yours with any $285 purchase use code BEAUTY19. The gift bag this year valued at over $470. This is a great opportunity to grab VINTNERS DAUGHTER active botanical serum! Diptyque Roses Scented Candle (3.4 oz)| Full size $65: Inspired by the fragrance of the English garden in June, this scented candle is a romantic medley of roses. It elevates the mood instantly and sets a sophisticated scene for any and every occasion. Sunday Riley Good Genes Treatment (5ml): Harnessing the exfoliating power of lactic acid, this intensive treatment helps to instantly brighten while working to reduce the appearance of fine lines and restore damaged skin. Hourglass Veil Mineral Primer SPF15 (0.12 fl oz): Discover a porcelain-smooth complexion that is free from visible blemishes with the help of this multi-purpose, oil-free, weightless primer. Oribe Gold Lust Repair &Restore Shampoo (1oz): This shampoo has been designed to cleanse hair, bringing it back to full strength and helping to remove impurities. Made with argan, maracuja andcypress extracts, it balances the hair and scalp in order to fortify and strengthen both. Ilia Beauty Tinted Lip Conditioner in Forever (0.04 oz) | Full size $28: Treat lips to subtle color and supreme softness with this sheer and buildable tinted lip balm. Packed with organic ingredients including cocoa butter, olive fruit oil, jasmine oil and vitamin E, it works to hydrate, replenish and soothe lips. Chantecaille Rose De Mai Cream (5ml): Inspired by the soft, dewy purity of a fresh rose petal, this advanced formula provides intense moisturization. Omorovicza Rejuvenating Night Cream (0.5 fl oz/15 ml) | Full size $235: Treat your complexion to an overnight spa session with this indulgent moisturizer. Briogeo Don’t Despair, Repair! Deep Conditioning Mask (1oz): This intensive weekly treatment helps to restore essential hydration and enhance hair’s resilience and strength with every use. Patchology Clean AF Cleansing Wipes (15 pack): Never wake up in your makeup again thanks to these vitamin-enriched face wipes. Not only will they help to remove all traces of makeup, oil and debris they’ll also leave your skin feeling clean, soft and refreshed. Verso Hydration Serum with Niacinamide (10 ml) | Full size $95: Reinforce skin’s protective barrier with this intense formulation, which offers lasting protection for dry skin. Coola Makeup Setting Spray (10ml): Keep makeup from shifting and melting with this SPF setting spray that helps to keep skin looking fresh throughout the day. Bumble and Bumble Thickening Spray (30ml/1oz): Turn up the volume with this blow-dry essential that delivers soft, touchable body. Clark’s Botanicals Deep Moisture Mask (10ml): Infused with active ingredients, including algae extract and comfrey root, this nourishing mask will impart brighter, glowing skin, and help reduce inflammation. 111SKIN Clinical Exfoliation (0.35oz) | Full size $140: This innovative exfoliator transforms from a gel to fluid to ensure quick and easy absorption into the skin. MALIN + GOETZ AHA Treatment Solution (0.2 fl oz): This exfoliating treatment also acts as a lightweight hydrator, replenishing moisture and minimizing the appearance of enlarged pores while reducing excess oil. Goldfaden MD Skin Balancing Mask (7 ml): The ultimate face mask for a tired complexion. Rich in botanical extracts, it features a unique blend of enzymes and multi-peptides designed to help revitalize and energise the skin. Kat Burki Vitamin C Intensive Face Cream (7ml): Banish tired, dull skin and say hello to skin that looks healthier and more radiant with this special formula that works to restore skin’s natural vitality and health. Rodial Pink Diamond Instant Lifting Serum Crystal (0.17) | Full size $135: Tackle tired skin with this triple-action flash radiance serum designed to elevate facial contours, brighten features and energize the complexion. Eve Lom Radiance Transforming Mask (8 ml): Restore radiance with this multi-tasking mask. Potent antioxidants and amino acids work to plump and firm, while exfoliating acids whisk away dry or dull cells, revealing a glowing complexion. Kevyn Auction The Flesh Tone Lip Pencil in Cerise (0.024 oz): Jojoba seed oil ensures this lip pencil glides over lips, giving a beautifully defined, clean line. The clever formula both hydrates with vitamin E, and locks your lip color in place for longer. Miriam Quevedo Platinum & Diamond Luxurious Mask (50 ml): Repair damaged hair with this anti-aging mask that works to restore volume. Active ingredients work from the scalp right into each fiber, helping to restore each strand of hair from the inside out. REN Radiance Glow Daily Vitamin Gel Cream (0.51 oz): Boost skin’s defences with this lightweight gel moisturizer, which contains powerful antioxidant vitamin C to prevent hyperpigmentation and reveal new bounce and luminosity. Christophe Robin Regenerating Mask With Rare Prickly Pear Seed Oil (1.7 oz/10 ml): A true hair hero, especially for colored or damaged tresses, this creamy mask gets to work in minutes. Prickly pear antioxidants revive and regenerate, while plant ceramides strengthen hair and increase shine. Emma Kardie Brilliant Facial Oil (0.17oz) | Full size 455: Feather-light yet brimming with nutrients, this oil comprises a blend of nine essential oils and five plant oils to help promote elasticity and deeply hydrate the complexion. By Terry Hyaluronic Hydra Powder Deluxe (0.45oz): Achieve an airbrushed finish with this innovative powder, which combines mattifying silica microbeads with hyaluronic acid to help keep skin smooth and hydrated throughout the day. RAHUA Classic Conditioner (22ml): Revive lackluster locks with this cult conditioner, starring rahua nut oil. Harvested in the heart of the Amazon rainforest, this wonder ingredient is rich in omega 9 to fortify and boost hair health. Lipstick Queen Altered Universe Time Warp (0.08 fl oz)| Full size $22: Achieve out-of-this-world volume and shine with this gloss, which shifts between two shades to give a multi-dimensional effect. Crushed pearls capture and reflect light, illuminating your entire complexion. R&CO Deluxe Waterfall Moisture + Shine (15 ml): Lusting after soft, shiny locks? This lightweight lotion will help to create a cascade of glorious tresses, thanks to reparative babassu oil and smoothing witch hazel. Dr. Dennis Gross Alpha Beta Exfoliating Moisturizer ( 0.13 fl oz) | Full size $68: Intensely nourishing hyaluronic acid, squalane and ceramides provide long-lasting hydration, while the brand’s patented blend of acids promotes skin cell turnover for refined texture. Derm Institute Cellurlar Rejuvenating Serum (0.17 oz) | Full size $210: An impressive roster of scientifically advanced ingredients in this serum works to improve elasticity and restore lost volume. Exclusive Fillift technology helps to boost collagen production, reduce fine lines and enhance smoothness.